There are two different skills included in the Word Play standard. The first deals with word meaning and the second deals with the impact of the word choice.The first skill for each grade level standard asks that students determine the meaning of words. This means that students need to have some instruction in context clues and the practice of noting when they don’t understand the meaning or way that a word is used in a text. The second skill set involved in the Word Play standard, just as the name implies, asks students to look at how words interact with the reader. When I think of this aspect of Word Play, I visualize the reader being asked to dance, sing, run, hop, or skip with the text. How is that invitation extended? Does the text demand it? Does it quietly whisper the request? Is the request pensive? How do the words extend an invitation to the reader to engage with it? That is the essence of Word Play. This is not a study of vocabulary words in isolation or a dictionary exercise. This skill is about that invitation. How do the words engage the reader? Students are looking at how specific word choices set the tone or alter the meaning of the text. This type of word meaning is about understanding the actual definition of the word. A student could look up the word and figure what it actually standards for. The contextual meanings are still literal dictionary meanings, but students may need to be able to determine what is most appropriate due to the content and context of the piece. This type of meaning is the opposite of the denotative or literal meaning of a word. When students consider the connotative meaning they are really considering different associations, feelings, and tones that those words evoke. The use of the adjectives, abrasive and blunt, to describe a person has very different feelings than candid and straight-forward. Both sets of words could rightfully describe the same person, but each word choice establishes a very different connotative meaning. Figurative language is helpful when the author wants to build an image in the reader’s mind. While technical and connotative are pretty straight forward, the definition of what counts as figurative can be exhaustive. Don’t get bogged down in teaching every single literary device in an effort to classify it as a way to develop figurative meaning. Focus on figurative language as a counterpart to the connotative or literal definition of a word. Your goal is to teach students ways to evaluate words and phrase–not get them to memorize lists. 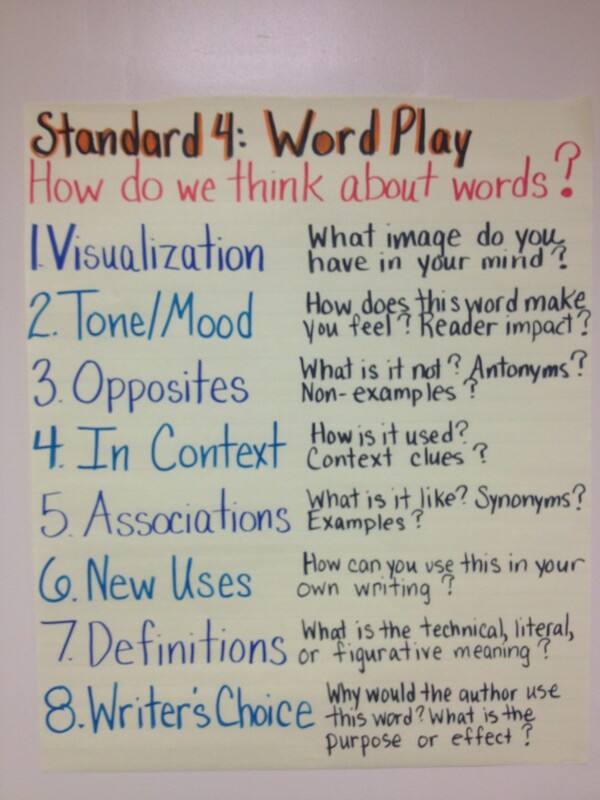 Here is the anchor chart that I use with students when discussing the Common Core Standard. As we consider the different ways that readers negotiate text and think about words, the list grows. Eventually we abandon Frayer models and vocabulary webs and I let students craft their own self-constructed models to explore a word. If like to have them divide their papers into four squares and write the word at the top. Next, they select four ways to think about the word or phrase and use each box for a different one. Thanks for the post here. As a literacy coach, I appreciate your information and am waiting patiently for the BOOK!!! For all the other Roz Linder fans join us and talk over on the new FB page (On the Web w/ Roz linder?) and Pinterest:http://pinterest.com/rozlinder/common-core/. PLNs are the best way to learn!! Let’s keep them active. WONDERFUL Post.Thanks for sharing your ideas. They help simplify all of this. Yes, this text simplifies the task of teaching word play which can be a difficult skill for students with language delayed or ESL. Thank you.